The steep increase in regulatory oversight of physician groups obscures the fact that the successful practice of medicine also requires adherence to sound business principles. 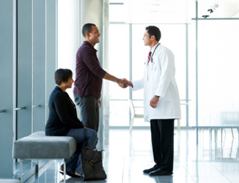 We help physicians define and achieve their business goals. This can include negotiating the formation (or termination) of third party relationships with IT companies, banks, landlords, employees and other third parties. We also are frequently engaged to help formulate the physicians’ compensation system and to design their governance structure. In addition, in the current market there is much talk about Accountable Care Organizations (ACOs), collaborative vehicles allegedly helpful in slicing the reduced number of health care dollars that will be available for provider compensation in the future. We will assist our clients in dealing with ACOs, including the ability to unwind the collaborations should the model prove unsuccessful.